We made the small time news! Victorian at Heart made it in the small community paper “The Headliner”. Check it out here! It was time for the annual train robbery trip on the Prairie Dog Central. Here are some of the best from my camera. Lottie’s first time for the train robbery! Shirley cozying up to the Sheriff! The “robbery” raised over $700 for cancer patient services. We stopped in Grosse Isle for some food and photo ops. Good advice for our young female traveler posted on the wall behind her! Here is the group posing with some of the desperados! 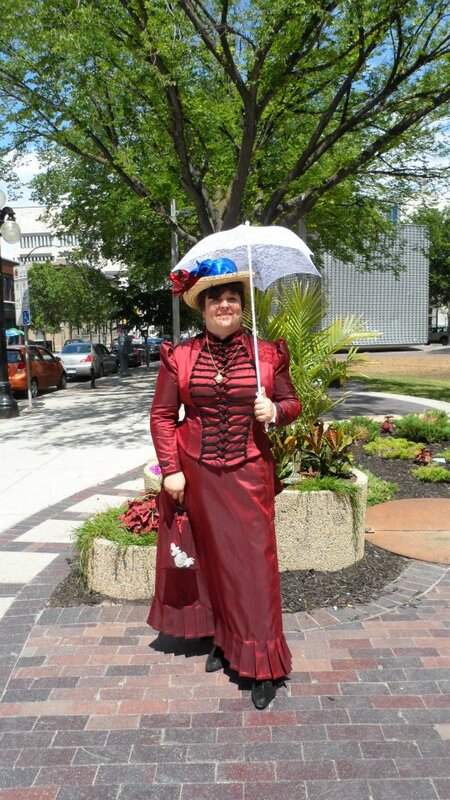 It was a cool wet day so some of the costume details got lost in wraps but Lottie and Shirley were in 1890’s and I was in 1880’s. We spent some time in the little house from 1880’s. A good place for photos when it is raining. 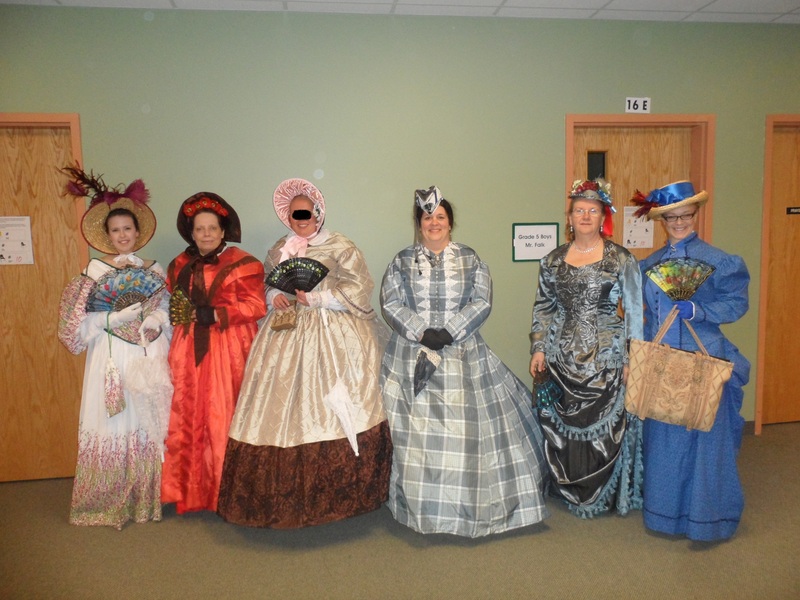 I had a Victorian fashion show at my church’s annual spring tea. I haven’t been given permission from all my models yet so I’ll have to dole out photos as they allow me. And I don’t have to many of them either! I forgot to arrange for someone in the audience to take photos of the actual show. The model on the left is wearing my 1880’s Travel outfit. It only took a pack and a half of pins to take it in. 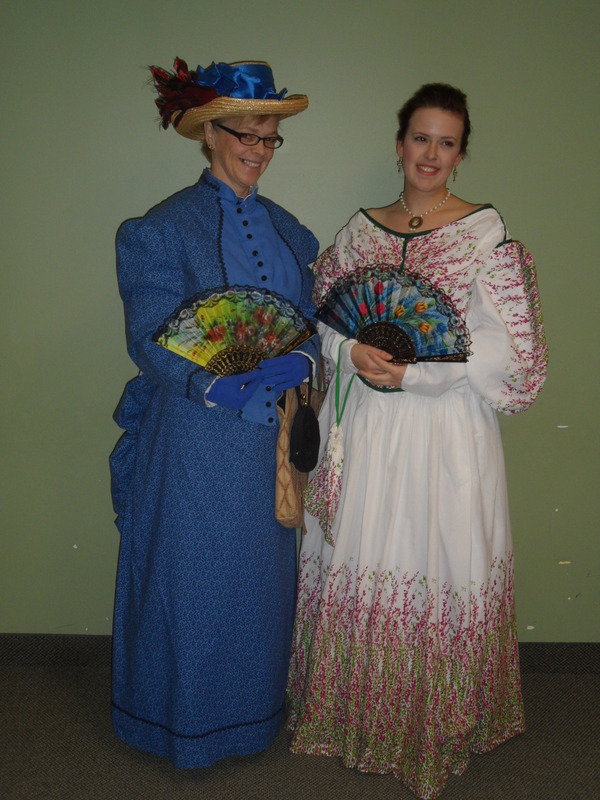 The model on the right is wearing my friend Shirley’s 1830’s dress. Ain’t she cute! Then we realized that she had striped down and made her put all the extra’s back on. Still cute. Thanks ladies! For Christmas, my pal Shirley, gave me 3 cabinet cards. Two were head shots of the same woman 10 years apart. She also gave me a card that shows the full length of a dress as she knows that this is what I covet most in these cards…the opportunity to see the dresses, as they would have been worn at the time. And if I can get ideas for my dresses, well all the better. 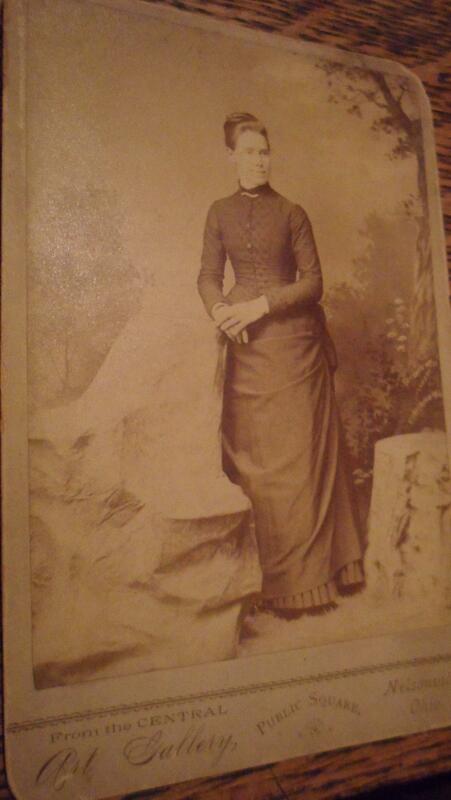 I’m guessing, by the dress, that it is an 1880’s picture. It looks like the pattern I used for my Travel outfit. 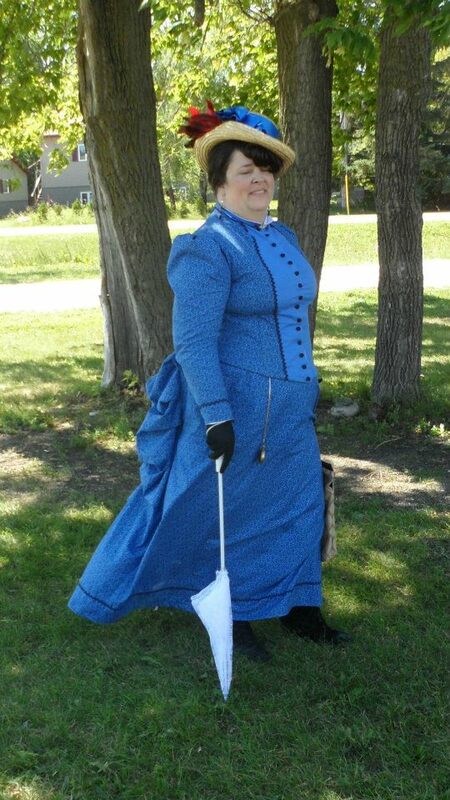 I did the two tone bodice like hers. 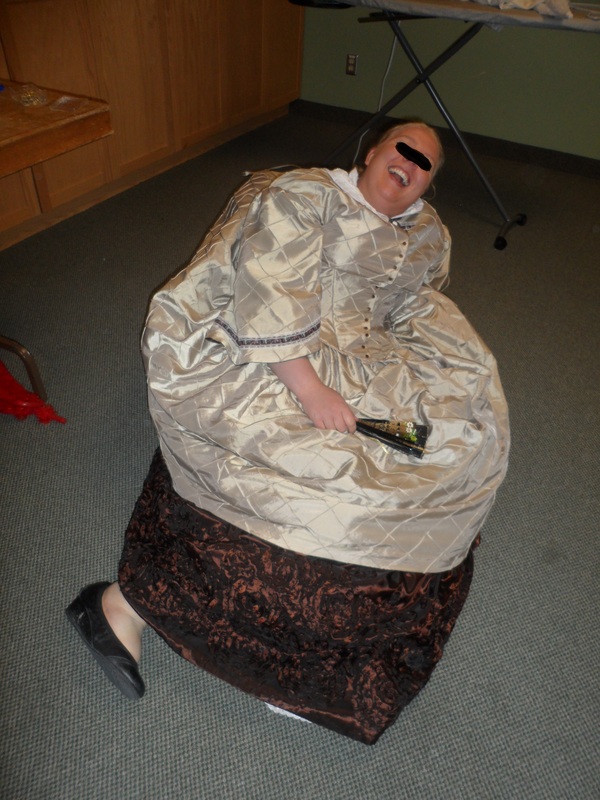 And my Half Grand Surprise dress. 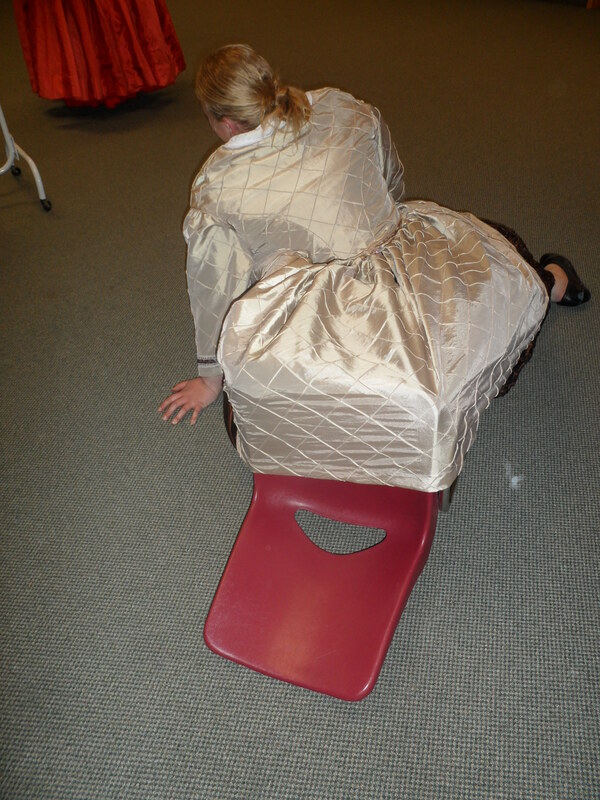 I had pleats on the bottom too. Only mine were sewn onto the bottom and hers looks like they are on an under skirt. I wish I was as skinny as she was! And she didn’t battle the girls either! I live in the city of Winnipeg and Shirley lives in Selkirk. Winnipeg is the capital of Manitoba and is MUCH bigger than Selkirk. But, it could have been much different if it weren’t for some enterprising business men and politicians. You see, the Winnipeg area is known to flood on a fairly regular basis so engineers looking to build a railway bridge across the Red River thought Selkirk would be a better spot. When Winnipeg was under water, Selkirk was high and dry. Also, Winnipeg had a second river, the Assiniboine, that was advantageous when furs and goods were being transported by canoe, but was another hurdle (bridge) to get over with a train. The government seems to have felt that not having to pay for the bridge over the river out weighed paying for a bridge in a safer location. Meanwhile, the planned railway route, which would have come through Selkirk was changed. The CPR was convinced to run the line further south as there was more virgin acres to be had that could be sold to potential settlers. The folks in Selkirk were told that the rail would still go through their town if they came up with $125,000 for a bridge. If they could not, they would straighten out the route and by-pass Selkirk. They could not come up with the money. 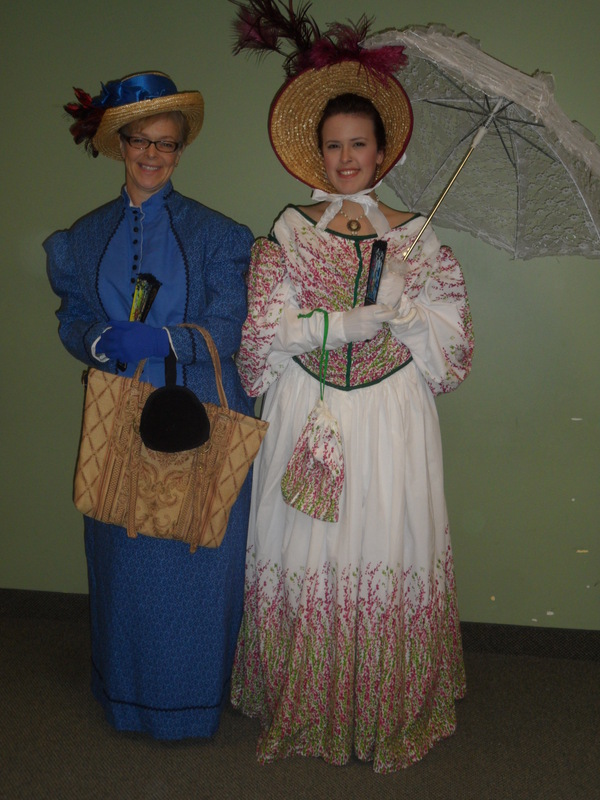 Seems appropriate that some 140 years later, a Winnipeg girl and a Selkirk girl, rode on a train together in Victorian garb. Almost, poetic.